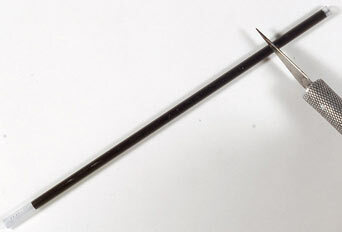 Parker fiber tip refills have not been manufactured for many years now. Fortunately, most of the larger Parker fiber tip pens have enough room in the barrel to use standard Parker rollerball refills, but this is not the case with slenderer models such as the 35 and European 45. Since these pens are now otherwise unusable, we have developed a simple adaptor that permits use of a ballpoint refill taken from a common BIC stick pen. Minor modification of the refill may be necessary, and is described below. The refill is a press fit into the front of the pen. Grip right behind the metal nib, twist, and pull. Padded pliers make the job easy and leave no tool marks in the plastic. 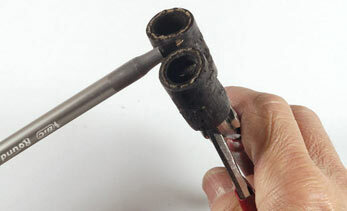 You can cut short pieces of rubber hose and slip them over the jaws of ordinary pliers. 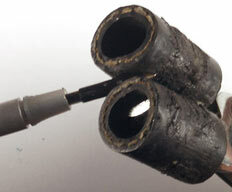 The adapter is shown below, along with an unmodified refill. Most standard BIC refills are too long and must be trimmed to fit. This can be a bit messy even if only a little ink escapes -- ballpoint ink is highly concentrated, and you'll need alcohol to clean it off -- so cover your work surface with some newspaper and put on disposable gloves. Don't cut the reservoir tube at the back end, since you'll end up cutting right through the ink, and you'll lose the air space at the end that provides a necessary safety gap between you, your pen's interior, and the ink. Instead, twist the point unit off the reservoir tube (finger strength should be enough), and trim the tube from the front end. 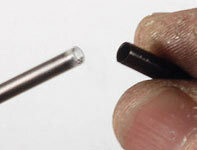 Overall length is not critical; we usually trim the reservoir tube to around 3 3/4 inches, or 95mm. Once the tube is trimmed, push the point unit back in place. A sharp blade makes for a cleaner cut. If you first tape down the ends to be cut off, they are less likely to spring away as the cut is completed, leaving threads of ink across your work surface. Don't forget to wipe down your blade with alcohol when done to remove any ink residue. The trimmed BIC refill should slip neatly into the front of the adaptor. NOTE: Make sure the BIC refill you are using has a tip small enough to fit through the Parker section. Some newer BIC Stic pens have a tip that is a bit too large, including the latest Round Stic. At last check, however, the Round Stic Grip's tip has the correct dimensions.